These cookies are delicious! The prefect amount of salty and sweet, with the added bonus of a flax egg! Preheat the oven to 375 °F (190 °C). Coat two baking sheets with cooking spray. In a medium bowl, whisk together ground flaxseed and water, let stand 2 minutes. In a separate bowl, whisk together the flour, baking soda, baking powder, and salt; set aside. Combine oil, sugars, vanilla, butter and nut flavoring in with the flax mixture. Gradually mix the flour mixture into the flax mixture. Stir in the chocolate chunks and nuts. Spoon 12 mounds on each baking sheet, spacing 2 inches apart. Bake 11 to 12 minutes, or until the edges are JUST slightly brown. (They will not look completely cooked at this point.) Place baking sheets on wire racks 1 full minute before removing from baking sheets. Serving Size: 1 cookie. 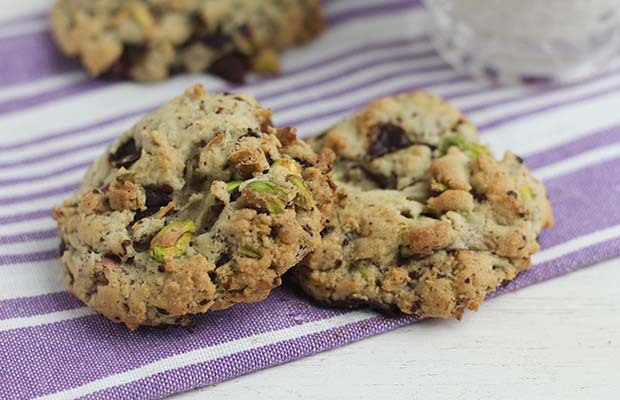 Each cookie contains 1/4 tsp (1 mL) ground flax.